2) The director is David Genesy who was one of my favorite professors while getting my MLIS. 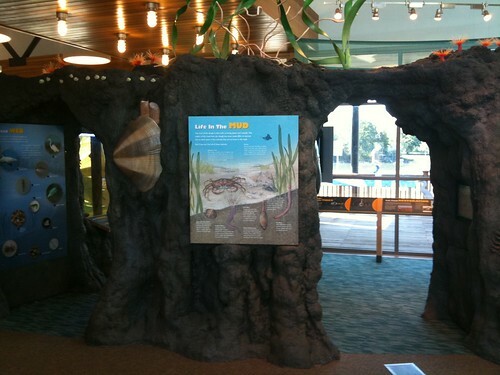 As you enter the library you are confronted by a giant interactive educational display about the ecosystem of the surrounding estuary. This structure reminds me of one of those science museums in San Francisco or the Monterey Bay Aquarium. 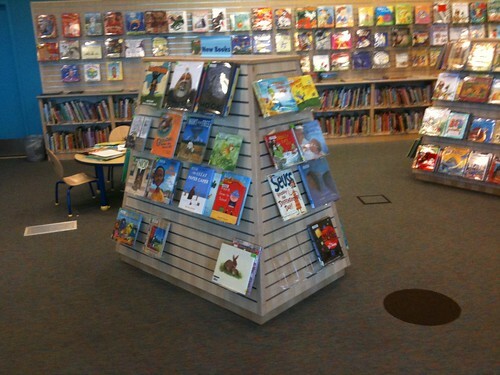 Right away it creates a sense that I’m entering a new kind of space and creates a great distinction between the outside world and the educational world of the library. I took this picture because from this angle there are no books or computers or any other indication that there is a whole library connected to it. 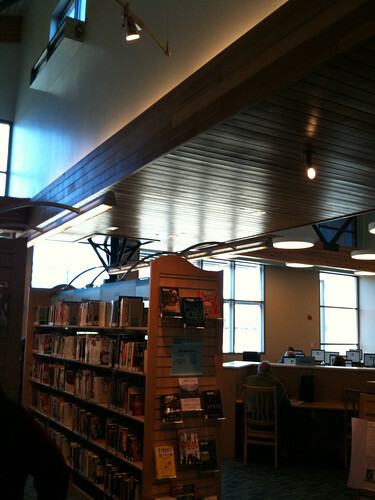 This is the entrance into the library from the community center area where I regrettably did not take any pictures. Also, to my right (you can’t see it) there is a little cafe that will be opening soon selling coffee, snacks, etc… with a nice eating area looking out over the estuary and the local wildlife. I didn’t take a picture of the cafe either as it was closed and I want to see what its like when it opens. I kinda of like this change of focus in the teen room. Away from the books and seating arranged for reading, and more integration of furniture surrounding the new technologies. While I despise television with the flaming hot passion of a thousand burning suns… The teens don’t feel that way, and they have game systems hooked up and can watch movies. I also love these chairs. I took more pictures of the them, but somehow they were lost into the abyss of the internet from my phone. We were told that these chairs are a year old and they don’t look much past a day. Apparently, they are very strong and sturdy. They also lend themselves to being repositioned where the teens like them and they can be sat in a number of different ways and that really the kind of flexible seating/work areas that I really love. If I had to pick one complaint about the library it would be it’s almost great lighting on the bookends or displays. But this is typical of almost all libraries I have ever been in. I’m going to write a blog post on the EXTREME importance of library display lighting and all of libraries failure to light their libraries well for marketing. But in this example, you can see there is a spotlight *almost* facing the endcap in a perfect position to light it up properly. To be fair, in other areas of the library there are quite a few well-lit book cases and overall I was very impressed with the lighting. There are many more things I could have taken a picture of in this beautiful library such as the boat and lighthouse themed children’s programing area. But when I looked at the pictures, they really don’t do it any justice and its really something you need to stand in front of (and go inside of) to really appreciate. Also, I was really impressed with the configuration of the computers in a semi circle (like the airport signal indicator on a mac) facing a very nice aquarium and some beautiful big windows with fantastic views. If you do want more pictures there are tons on flickr taken by far better photographers than me. 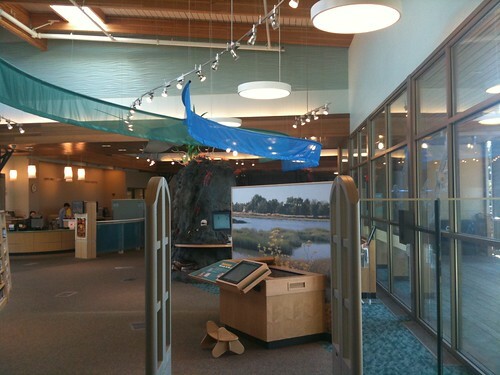 Here is a link to a bunch of Redwood Shores Library photos.